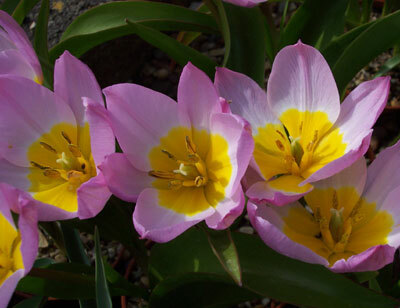 Generally suitable for garden, rockery, raised bed or border in a well drained warm soil in full sun, Flowering March to May plant some the bulbs about 10cm deep. Short stems of several star-shaped white flowers, which have extensive reddish-brown veining on the exterior, silvery-green leaves, native to Japan, well drained raised bed. 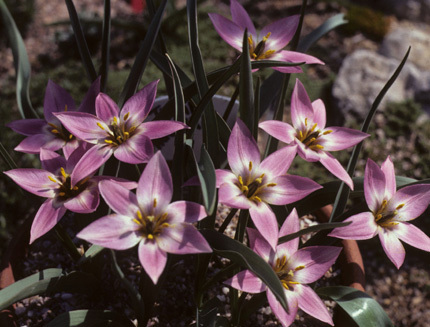 A rarely offered species from the Savoie Alps in France with bright crimson-red flowers in late Spring, the bulbs are usually stoloniferous. 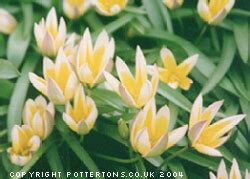 Pretty cup shaped white flowers in February often tinged with pink or purple, large yellow centre, 15cm. 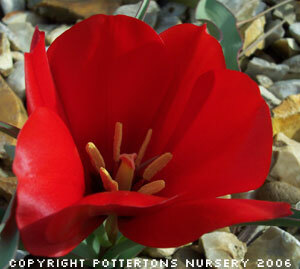 A very distinct variety of large, thin and tall creamy flowers, red outside, the base is purple. On stems to 25cm. 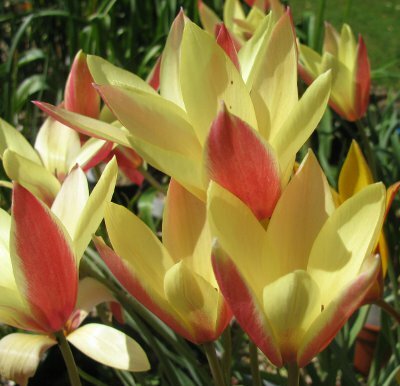 Another relatively new and very distinct form of clusiana with large upright flowers, the inner petals are yellow/orange with slight red feathering, the outer petals dark red with darker central line. Flowers end of April to mid May, 20cm tall, fully hardy. 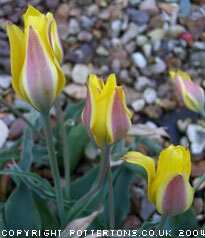 Dark violet-purple flowers and a yellow centre, one of the best, 15cm tall February-March. 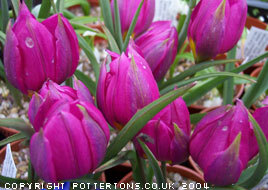 Stunning magenta-rose flowers, with a bright yellow centre, to 10cm in March. 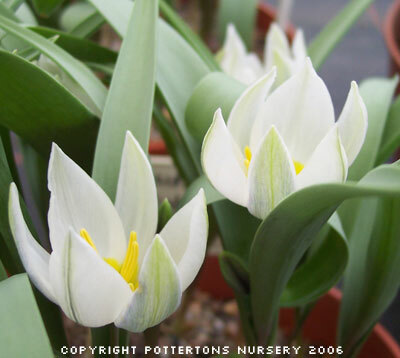 Thank goodness not all our bulbs have such long names, however this variety is quite unique by name AND outstanding in appearance. 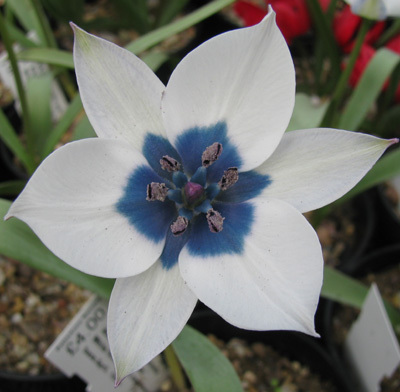 Large white flowers with a deep steel-blue base in April, 10cm. Vivid violet purple flowers with a black centre on the inside, in mid February or early March. 10cm. 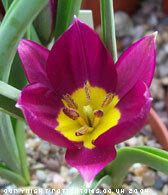 Attractive bright purple-violet with a yellow centre when the flower opens, 10cm, late February to March. Lemon-yellow flowers stained crimson on the exterior with a hint of sage-green at the base in March, 20cm. Large bright yellow flowers on short 10cm stems, distinct unusual green-blue prostrate leaves which curl upwards, with a wavy edge. Brilliant scarlet flowers with jet black centre, narrow undulated leaves with red margins, April-May, 20cm. A fine species for the garden. 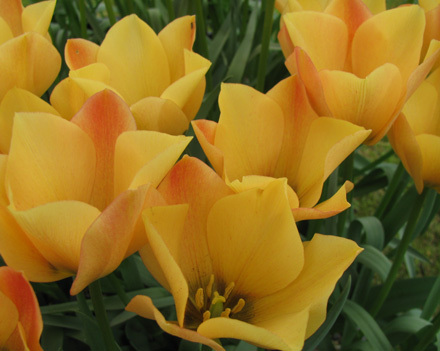 Good solid flowers, cup-shaped bold apricot coloured flowers up to 15cm tall from late April to May. 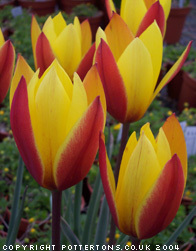 This is an easy reliable species that we offer in three good colour forms. A good variety with sulphur yellow flushed orange flowers in April. 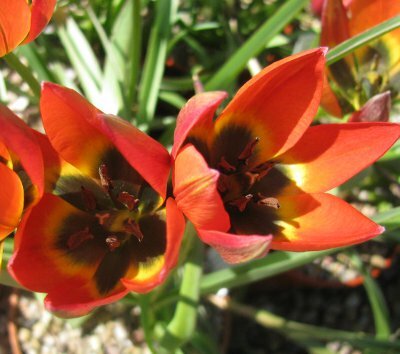 A glorious late spring flowering bulb with flowers in shades of bronze and apricot. 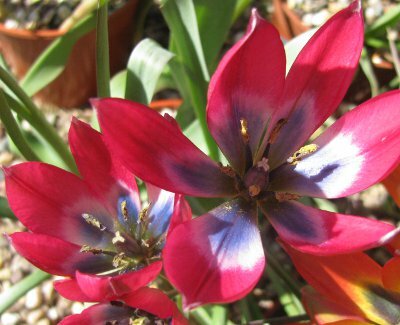 Very unusual and striking cherry-red petals, whiter towards the centre with a dark slate-blue central mark, on short stems. A new and welcome introduction to our catalogue. 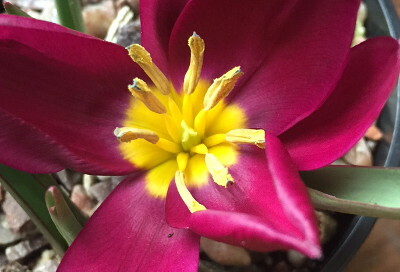 Marvellous dwarf hybrid to only 10cm tall in April with startling flowers, lightly fragrant, brilliant copper-orange, suffused yellow towards then centre with a very dark blue-black centre cross. Stunning. 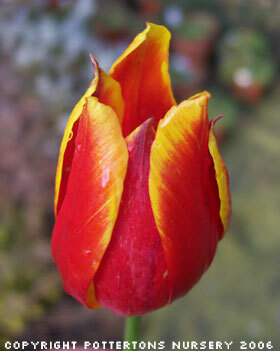 Deep vermillion red with yellow stamens in April, 15cm. Free flowering selection, light purple exterior, inner petals lighter, large circular deep lemon base, yellow anthers, 15cm. 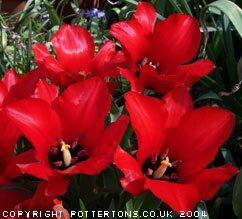 Striking scarlet flowers with a thin orange line around the petal edge, 10-15cm tall stems. Sweetly-scented flowers golden- yellow, slightly tinged with green. 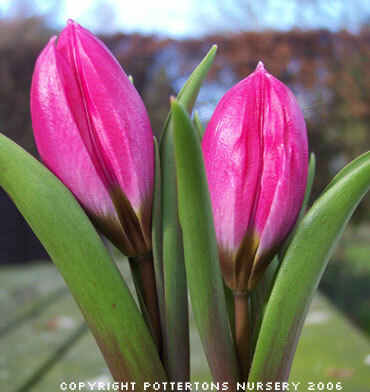 Flowering March to April on 25cm stems, new introduction this year to our catalogue. Stems carry five to nine flowers per stem, star-like white flowers with orange-yellow centre, anthers dark purplish-brown, February-March. 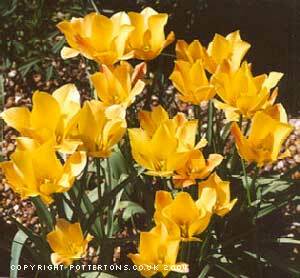 Golden-yellow with bronze reverse, easy and durable in most positions in the garden. 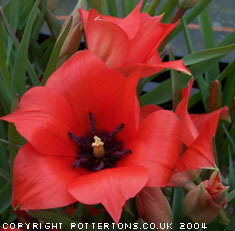 A large and spectacular bulb with bright orange-scarlet flowers in April up to 30cm.